"Lenin" redirects here. For ither uises, see Lenin (disambiguation). 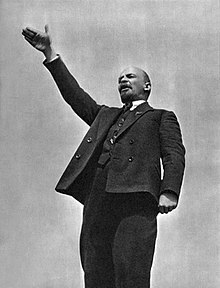 Vladimir Ilyich Lenin (help·info) (Roushie: Влади́мир Ильи́ч Ле́нин), (22 Aprile (10t April A.S.), 1870 - 21 Januar, 1924) wis a Roushian revolutionary, the heid o the Bolshevik pairtie. Lenin wis a pen-name; he wis born Vladimir Ilyich Ulyanov (Улья́нов). He wis the first leader o the Soviet Union. He's kent as the foonder o Leninism forby, that wis cryed Marxism-Leninism by Joseph Stalin later on. At the schuil, Lenin was unco guid at the Laitin an the Greek. Houaniver, in 1887 he wis flung oot o Kazan State Varsitie for bein ower radical an protestin agin the Tsar, that wis the leader o Roushie at the time. In that year, his brither Alexander Ulyanov wis hingit for his pairt in a bomb plot tae kill Tsar Alexander III. Lenin gaed on studyin bi hissel, an in 1881 he gat a license tae be a lawer. While he wis studyin the law in the Roushian caipital St Petersburg, he foond oot aboot the thochts o Karl Marx an Friedrich Engels. Acause Marxism wisna alloued in Roushie, Lenin wis liftit an pitten in the jyle for a year, than exiled tae Siberie. In Julie o 1898, whan he wis aye in Siberie, Lenin mairiet a socialist wumman, Nadezhda Krupskaya. In 1899, he set furth a beuk cryed The Development o Caipitalism in Roushie. In 1900, Lenin wis lowsed frae Siberia. Aifter he wis alloued tae quat Siberia, Lenin straivaigit aboot Europe. He began tae set furth a Marxist wittins blad cryed Iskra ("Spark"). He became a hie-up member o the Roushian Social Democratic Labour Pairtie, or RSDLP. In 1903, Lenin haed an airgiement wi anither leader o the RSDLP, Julius Martov. This airgiment, aboot the organisation o the Pairtie (Lenin wantit a strict, centralised, an disciplined model - Martov a less strict, less centralised ane) dividit the pairtie in twa. Martov's uphauders became kent as Mensheviks ("minority"), Lenin's uphauders as Bolsheviks ("majority"). In fact Martov's uphauders wis a majority in the RSDLP, but Lenin's uphauders haed a majority on Iskra's editorial buird, whaur the name wis taen frae. Lenin flittit tae Finland in 1907, acause it wis saufer for Marxists in Finland nor in Roushie. He stravaigit aboot Europe, visitin monie socialist convenes an events. Durin this time he bydit in different airts like Lunnon, Paris an, during Warld Weir I, in Geneva. Whan weir brak oot, the Seicont Internaitional, that includit the Bolsheviks, brak doun, whan sindrie member pairties uphaudit thair kintras in the weir, gaun awa frae the Marxist idea o internaitionalism. Lenin an the Bolsheviks wis ane o a haundfu o groups an fowk juist that stuid agin the weir for Marxist reasons. Aifter Tsar Nicholas II abdicatit acause o the Februar Revolution, Lenin gaed back tae Roushie. He becam an important Bolshevik leader, an set furth the April Theses anent whit he sayed wis mistaks o the new middle-cless guvrenment o Kerensky; he cawed for a warkers' revolution tae owerthraw the guvrenment. Lenin spak aboot mistaks o monie members o the Bolshevik Central Committee an aw (includin Zinoviev, Kamenev an Stalin) that helpit the guvrenment tae haud on fechtin the weir, agin whit the Leninists wantit. Durin Julie 1917, whan Lenin wis fund guilty o bein fundit bi the Germans, he haed tae flee tae Finland. In October 1917, the Bolsheviks unner Lenin an Trotsky wis at the heid o the St Petersburg Soviet and ither Soviets aw ower Roushie takkin pouer frae Kerensky's Proveesional Guvrenment; this wis kent as the October Revolution, an it resultit in the first Communist state in warld history. On November 8, 1917, Lenin wis waled Premier o the Soviet Union bi the Congress o Roushie Soviets. Acause o the German invasion o Warld Weir I, he signed the Treaty o Brest-Litovsk. Roushie syne tynt a lot o laund, but the Germans didna invade onie mair. Aifter he becam leader, Lenin shut doun the Constituent Assembly. He shut doun aw ither poleetical groups that wisna Communist forbye. Fanya Kaplan, an anarchist, syne shot Lenin three times wi a revolver. Durin the Roushian Ceevil Weir, Lenin stairtit weir communism. Houaniver, aifter the weir, Lenin brocht in the New Economic Policy. Some private enterprise wis alloued, but no muckle. Frae whan Kaplan shot Lenin, he stairtit haein monie strokes. Bi Mey 1922, he wis sair paralysed. Aifter a stroke in Mairch 1923, he cuidna spaek or muve. Lenin's fowert stroke kilt him in Januar 1924. The ceety of St. Petersburg wis renamed Leningrad, but aifter the Soviet Union fell in 1991 it got cawed St. Petersburg again. Afore Lenin dee'd, he sayed he wantit tae be birriet aside his mither. Whan he dee'd, the Communist guvrenmen lat the fowk o Roushie come an leuk at him. Acause fowk keepit on comin, thay decidit no tae birry him. A mausoleum wis biggit in Reid Square, Moscow, ower Lenin's bodie, sae that fowk cuid aye see him. Efter a pouer struggle in the Communist Pairtie, he wis replaced bi Joseph Stalin as leader o the Soviet Union. Lenin's last testament sayed that Stalin wis ower rude an incautious an shuid be gart demit frae the poseetion o General Secretar o the Communist Pairtie; houaniver, thon testament wis suppressed bi Stalin an his uphauders aifter Lenin's daith. Wikimedia Commons haes media relatit tae Vladimir Lenin. This page wis last eeditit on 19 Februar 2018, at 18:59.